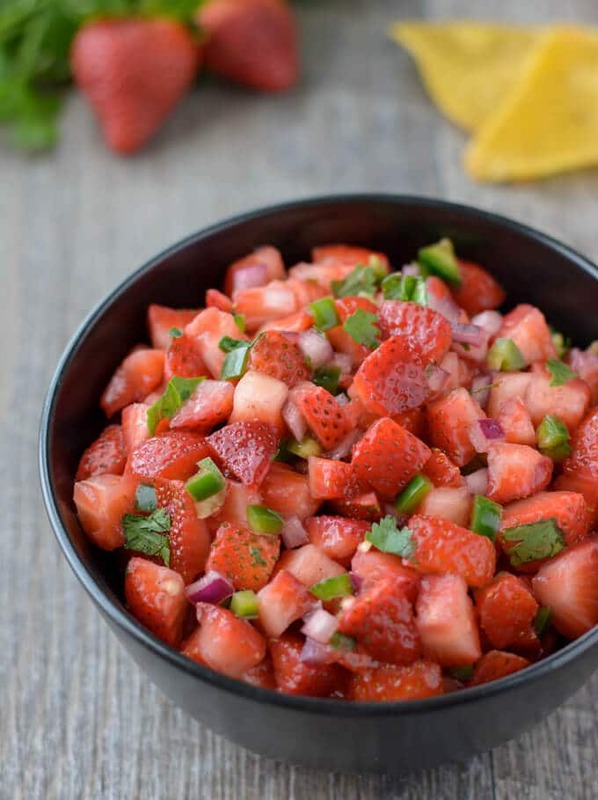 This Strawberry Salsa is a sweet and fresh salsa that looks as good as it tastes. Serve it with tortilla chips for a tasty snack or as a topping for fish tacos. Either way, it delicious! Strawberry season is upon us, and I could not be more excited. Warmer weather is here and Spring is one of my favorite times of the year. Whole Foods recently had their organic strawberries on sale for $3.50, so I just had to buy some. No real plans for what to make with them, but they looked so good, I got them anyway. 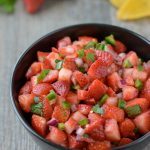 My Peach Salsa recipe is a favorite of ours, so I decided to make another fruit salsa using strawberries instead of peaches. Instead of the typical lime juice used in salsa, I used some white balsamic vinegar. It adds an extra little hint of sweetness and goes so well with strawberries. Cut the strawberries into small diced pieces. Mince a large jalapeno, removing seeds and ribs or leaving some for a bit of heat. 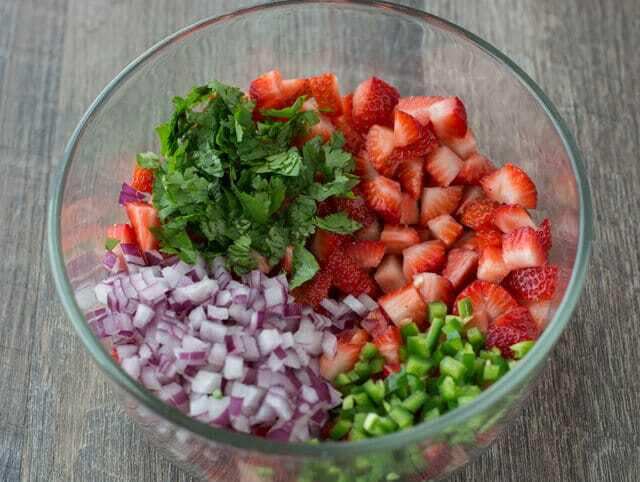 Finely chop some red onion and coarsely chop some fresh cilantro. Place into a medium bowl, add some white balsamic vinegar, cumin and sea salt. Mix to combine, allow thirty minutes for flavors to marry then serve. 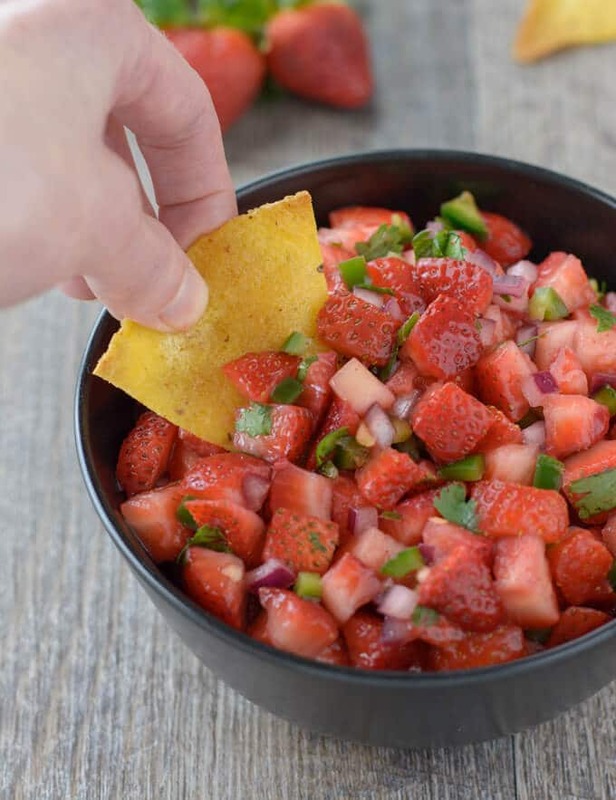 You can serve Strawberry Salsa with tortilla chips for a snack or appetizer. It also makes a delicious topping for fish tacos! We had ours both ways. We had it for a snack with chips, then for dinner, I served it on top of some fish tacos I made. It was super tasty both ways. A delicious new take on traditional salsa. Sweet strawberries take the place of tomatoes in this tasty and healthy dip! Place into a large bowl and mix to combine. Allow 30 minutes to give the flavors a chance to marry before serving. Check seasonings and adjust if necessary. Store leftovers in an air-tight container for up to 3 days. If strawberries are really tart, you might try adding a little honey. By Tempie at April 7, 2018 .